Roy: Yes your idea is great and we will all learn from your experiences and may be able to help. I don't see it working out any cheaper than the 9DOF board with simple code to just output the sensor info so we can use the prop to do the filtering. I am unsure if we need all the sensors either, but the cost within the board framework is small. If I were doing a pcb it could be left off. The compass is 3-axis $20 so I think it takes care of tilt (probably by our software). Maybe we need it, maybe we don't. Buying little modules works out expensive and then all the connections are a potential source of problems in a vibration area. Hanno: Thanks for your input. I know you have a lot of experience here. So I think I may go the 9DOF route and use a proto board initially until I know what to put on a specific pcb. 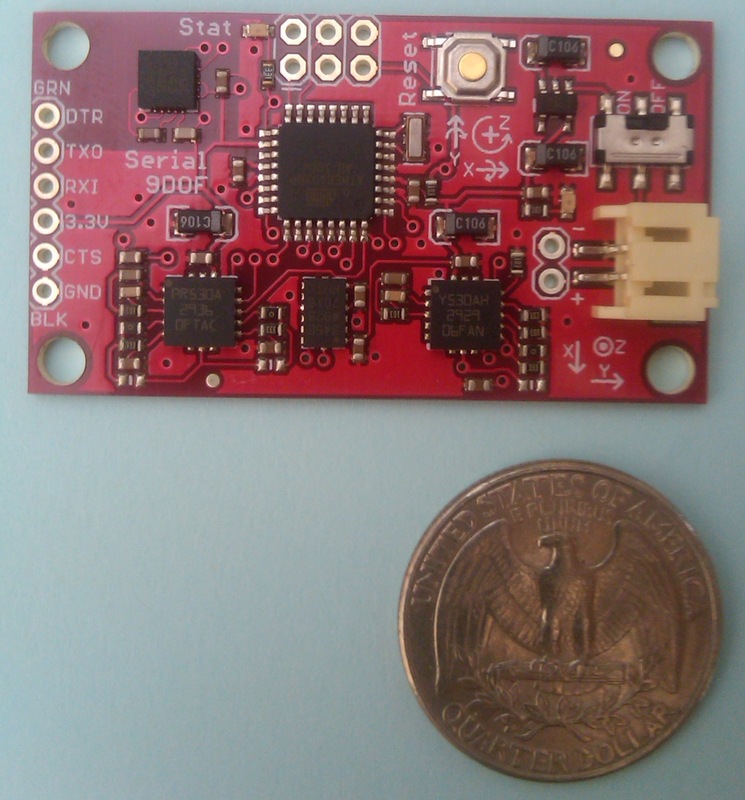 I have the Acc_Gyro, it's a 5DOF IMU, uses a LIS331AL 3 axis accel and LPR550AL 2 axis gyro - it's $50. One thing I've also been thinking about is thermopiles. If your intent is just to stay level with the ground, maybe just use 2 thermocouples and a gps? Roy, you are totally right. Less sensors could do the job but I'm still beside Cluso's idea with the ready made 9DOF. As many sensors as better results we can achieve by mixing all measurements. It's more difficult to build it but it is worth. I'm working in telecom and it happened to me so many times that a GPS or a compass showed me a totally wrong way because of the MW radiations around me. By writing the code we will need to take this in count and avoid mixing for example a flagrant compass value. As soon as we decide what way we will go and fix the prototype component list, I will test all of those in such circumstances. Regarding ultrasonic measurements, I have not that bad experience. Was trying to measure distance on different surfaces, grass, wood, sand ...etc. the measured values differs just a few cm's. Should not be a big thing to hit the ground from a hight of aprox. 5 cm Any other experiences in landing or ultrasonic measurements? Ultrasonics will be fine to measure from the bottom of the quadcopter. If it is not level it will not matter as the error becomes less as you approach the ground. Nick: I will PM you over the w/e. The sensor only is $5 but we are not allowed to copy the circuit nor given the info for the pic they use (not sure if we could get the prop to do the ADC). This could still be a nice project. Although the serial is slow IMHO, I do like that the device will run at 3.3V and serial is 0 to VCC. I also like the custom beam widths. Trying to understand the 0"-6" in the spec sheet. Is it optional or programmable? Relying on 6" for final approach is too small. It would be great to switch to 6" when you know you are almost there for landing. I figured I would take one for the team and purchased the 9DOF from sparkfun to start some testing. Since I am impatient, it will be here tomorrow morning. My thoughts are to do some bench testing and then log some data with the 9DOF as a payload on a fixed wing plane and a copter tomorrow.... weather in Virginia is supposed to be amazing!!! Let me know if anyone has anything specific they would like tested or measured. I plan on logging the serial data stream at different attitudes from both on the bench and in the air, and posting video and raw data here. This should give us some preliminary data and a jump start on coding and debugging tools. If anyone is interested I can connect the Propeller up to my lantronix Xport (serial to ethernet) along with a web cam for a remote test rig. I have a static IP, and for any serious coders that don't feel like forking out the $125, or sending test code back at forth.. this might help things along. Jim: The module contains a PIC and it is programmed to give 1"-255" outputs, but <6" gives 6" so 6"-255". 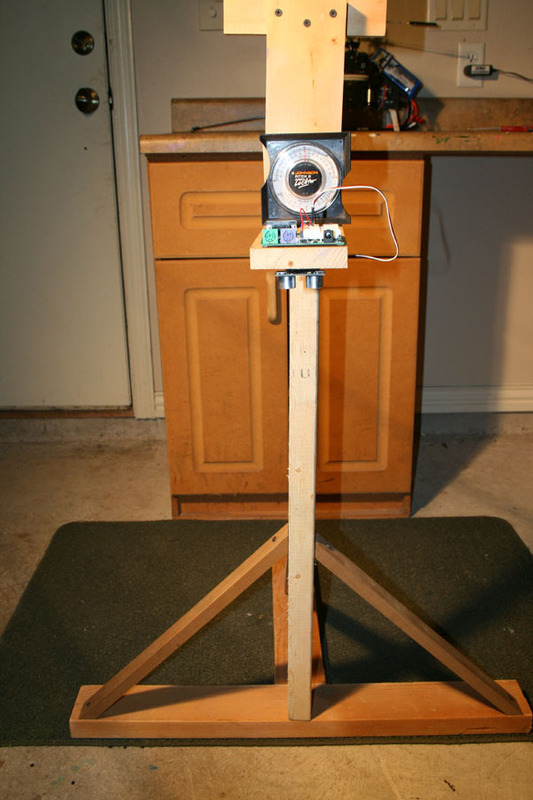 It must be >=6" off the ground when you power it up so it can calibrate itself. The ADC is required if we just use the transducer and make our own circuit. Lower pcb - "Power Distribution"
The 9DOF software is LGPL so it can be used if desired, or we can write our own. We can decide how much is in the prop and how much is in the Atmega. My preference is to place as much in the prop as we can and just use the Atmega to sample all the sensors and pass the results to the prop for processing. Have I missed anything ??? Ambitious, but hey, may as well include the options for it. Any comments ??? Looks good so far except for HMC5843 Digital Compass buried between boards. I am no expert but intuition would lead me to expose that sensor above all circuitry. I'm not even sure how that sensor, (or any magnetometer for that matter), would react in the middle of 4-8 motors with some pretty powerful magnets. Just thinking outloud. I'm excited about the reaction from the community, and John for getting the actual hardware to play with! Thanks John! Jim: The motors and escs are located as far away as possible (motors at the ends of the beam and esc nearby). The electroncs (+compass) are in the centre of the quadcopter. The GPS must be on the top for it to see the satellites. I figure the centre is the best place for the sensors, but this method would allow them to be reversed as I am using cables to join the pcbs, not stack plugging as I think vibration would ultimately be a problem. Leave a few pins to control servos in case we decide to add camera mount later. My motors are ~12 inches from the center board area, is that distance too close? I was also thinking about mounting the compass on a post sticking up above everything a few inches (I've seen this in a few other projects). I was hoping that the calibration feature of the compass would help account for the frame and motors that are always there and at the same locations relative to the compass. Tonight I plan to work on my code to get all the sensors read and filtered (kalman and PID) and have that drive some servos using my PPDB test circuit. 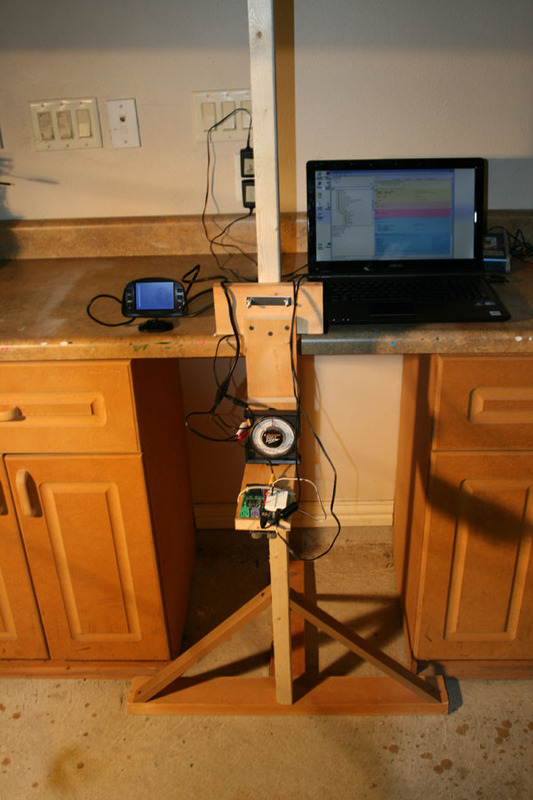 I can play around with tilting and turning and shifting the PPDB around and see the output in PST and on the servos. That should let me dial in the basic code structure and such, then tomorrow I can put everything on the Protoboard and get that onto my frame with motors and start testing/tuning the code with the tethers keeping it safe. Also, if you build a frame with landing gear / feet and stuff, then it's likely that you could have 6 inches between the Ultrasonic sensor and the actual ground while the craft is on the ground (on it's feet). With all this talk here of using Ultrasonics for detecting the ground when close, I have been considering using one or two of my PING)))'s on mine. Check out the Propeller Wiki·and contribute if you can. The data sheet on the compass module with tilt compensation (OS400-T) describes the affect of rotating magnets close to the unit. This unit is sold on the Sparkfun site. Robert: The motors will be some distance away so hopefully minimal interferance. We can always raise the pcb above the frame. 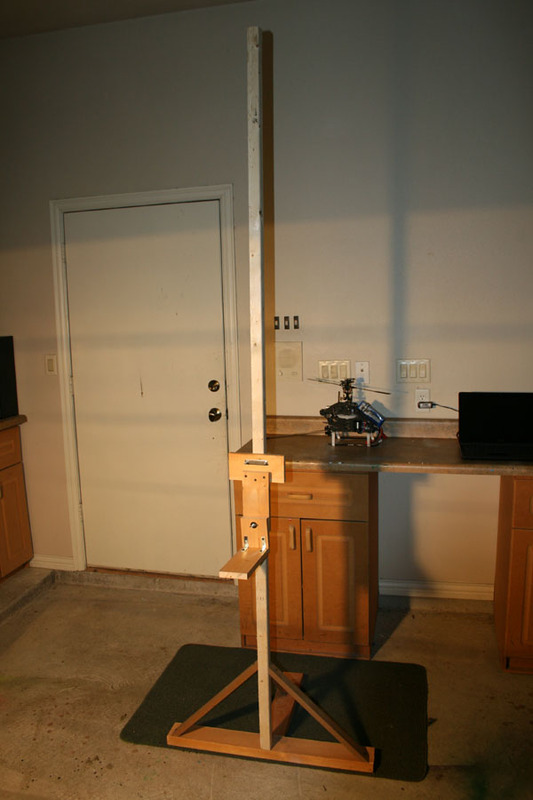 Yes, there is provision for up to 8 servos, so camera control is possible, etc. Roy: Yes, with feet we can get the 6" easily. A 1m length can be cut almost in half and the shorter piece in half again to give a quad with ~250mm length·(radius) arms. A guess... A set of pcbs might cost ~$30 if I can get enough interest. Does this sound interesting??? Here is the Frame pcb - Power Connectors to be added for the Motor ESC's, one at each frame post (whatever they are called). It will take a QuadCopter or HexaCopter design with 3.2mm dia holes using rectangular tubing (carbon fibre). Use 2 pcbs, one on top of the frame and one at the bottom located at the centre of the posts. Only 1 pcb is loaded, but it is cheaper to have 2 identical pcbs fabricated. I will try and use a similar method for the motor mounts. I wouldn't use a PCB to join the arms it seems a recipe for broken tracks in the event of a crash or hard landing. Better to clamp the carbon rods too if you can rather than drill them if you can. Graham: Does the idea of using a pcb to hold the arms make sense? We could always use a 3rd pcb to be the power connector. It would just make sense that they be identical pcbs to keep cost down. Certainly the rods (square carbon fibre tubes) could be clamped down between the pcbs. However, I have allowed for holes at 0.5", 1" & 1.5" radius out from the center. I would expect just the 0.5" & 1" would be drilled into the tube. We could clamp near the outer edge on either side, but would have to decide the tube size before I could put these holes in, or leave the user to drill these (not so good). Thinking a little further, I would rather the arm break than the pcb mounting (i.e. the mounting plate) because that could result in damage to the sensor/conroller pcb as well. Better for the arm to be sacrificial. I would expect to do a similar thing on the outer ends of the arms for the motor mounting. The GPS is also from Parallax - The PMB-248 is cheaper so may as well use it. BTW the elevation on GPS's is not that accurate. I have had readings on my boat out to sea of >20m when 2m should be the actual value and this is not a tidal error. However, over a flight time, its accuracy is likely to be fairly consistent so as long as we record this when taking off, it should be close for bringing the craft back close to the ground. Does anyone have the exact measurements and hole sizes for motor mounts? Also, are there differences for the various motors? My mounting plate/motor is currently interstate. dMajo: Nice find, thankyou. An alternative using 3 arms and 6 motors - interesting. dMajo - thanks for the link, that Dragonfly device is inspiring. I was curious on the cost so I clicked on the request quote button. The base model is US$16,995.00!!!!!!! I must say I like the twin motor pairs. I had not seen that before. This is one of the nicest frames I have seen, especially if you are mounting a camera. The motors are mounted on square carbon fiber rods but the under carraige is designed to balance a camera and battery to keep the center of gravity centered on the motors. I think that the price is a bit high and I think also that kf4ixm is wrong. I think that probably you will end to around 5000 (material costs) then you have to take in account some incomes. And finally I hope that some good engineering has been put in the software and in the mechanical project (eg. I hope that if you make a wrong landing you doesn't destroy everything). But this is not my field. The 9DOF just got here, let the testing begin. Attached is a picture for anyone that has not seen it before. Once we have an idea of weight we can start calculating motor size. Here is a link to a site that I have purchased some motors and ESCs before. They also have a FAQ section that explains some basics of selection criteria. One thing to keep in mind is that not all props are easily available as pushers, we don't want to pick some off the wall sizes that we have to order from China. Now the fun begins! I recommend using one of the gyro's to tell you if the craft is turning about it's axis- that's what everyone in the rc-helicopter world does. The gyro very accurately measures how quickly you turn about an axis- no matter the tilt or magnetic field. 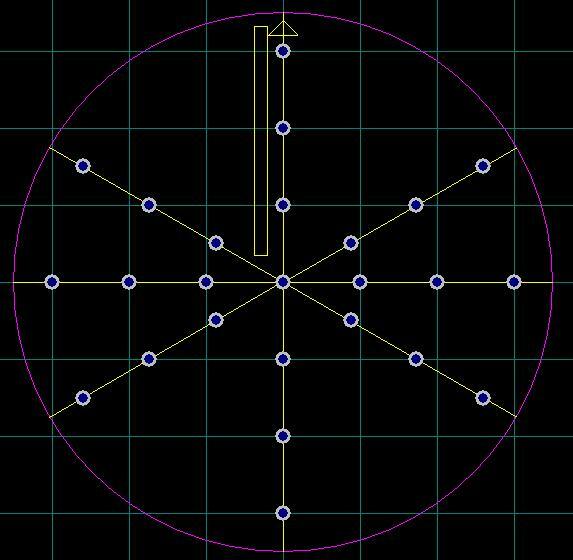 If you need a compass for navigation you might be able to low-pass filter (on the order of seconds) the compass signal to reduce tilt/noise from fields- but that won't help you with the very short-term corrections you'll need to keep it stabilized. Of course you could always kalman filter the gyro and accelerometer signals to get a steady signal that doesn't drift. Most of the Quads/Hexa copters run 1000 to 1200 kv/rpm brushless outrunners. Most propellers are 8 to 10 inch diameter with a pitch of 4 or 4.5 inches. Also some have mounted these motors upside down using special motor mounts. Not sure why this is done. I tested the Parallax Ping))) Sensor using concrete as the reflective surface. The Sensor was tested at 10, 15, 24, 30, 40 ,60, 70, 80 inches with tilt of 0 to 40 degrees. The sensor was accurate at all heights from 0 to 30 degrees. At 35 degrees of tilt the distance measured was not always accurate. I couldn't attach an Excel spreadsheet so I converted to text file. The column headings don't line up but the first column is the height of the ping sensor measured with a ruler. The second column is the height as measured by the PING))) sensor and the third column was the angle in which the sensor was tilted. Here are a few pictures of my apparatus for testing different sensors. Sale costs have to include production costs AND development costs. After spending over an a hour on the site and viewing the videos, this company, it is my opinion, has spent many thousands of dollars to produce this quality product that is worthy of the cost. Let's not pollute this thread with debate on a subject that's not directly related to Ray's original post.. We could take it to the Sandbox to discuss further. Sorry, while i respect your right to disagree with me, your comment saying that i am wrong without proving that im wrong it is just plain rude. sure there's some cost involved, but buying parts in bulk as most companies do, i still say theres not that much cost in the production. I think that the price is a bit high and I think also that kf4ixm is wrong. Cluso, I would tend to keep the airframe and the circuit boards as separate entities, possibly with flexible mounts between, it is easy enough to make various plates etc from epoxy glass or carbon fibre to a high quality even with hand tools.